Corn is America’s crop, with more than 80 million acres of the gold stuff dotted all over our nation’s landscape. It has become a visual staple of picnic tables, movie night and supper time for decades now. Not to mention, the role corn played in the lives of Native Americans and the survival of settlers. But if you are going to consume corn, you should always opt for organic, whole, non-GMO, fresh corn on the cob. When you reach for these kernelled cobs of goodness, it is easy to understand why it has been a favorite for generations. Not only is fresh corn on the cob tasty, it is also full of nutrients that may be good for your health. For example, the phytochemicals contained in fresh corn may help lower cholesterol levels and prevent anemia. Corn also contains a myriad of nutrients such as vitamin C, vitamin B and magnesium. 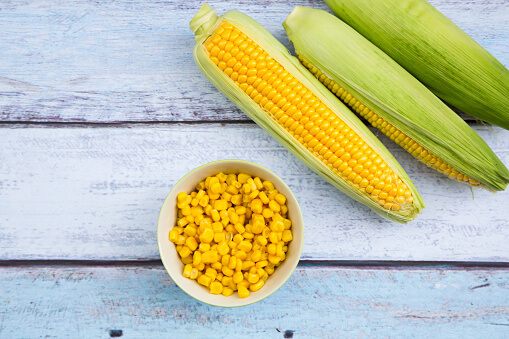 Corn is loaded with two phytochemicals that promote healthy vision - lutein and zeaxanthin to be exact. Lutein and zeaxanthin are types of carotenoids. Carotenoids are fat-soluble pigments found mainly in yellow, orange and red vegetables and fruits and are excellent for eyesight and slowing the progress of macular degeneration. In nature, lutein has been found to absorb excess, high-energy light rays to help protect plants from too much sunlight. Research uncovered high concentrations of lutein and zeaxanthin in the macula of the human eye. It is believed that the presence of lutein and zeaxanthin in the human eye are largely responsible for reducing retinal light damage that leads to macular degeneration. “Of the 600 carotenoids found in nature, only these two [lutein and zeaxanthin] are deposited in high quantities in the retina (macula) of the eye,” according to the American Optometric Association. Broccoli, Brussels sprouts and spinach are also rich in lutein and zeaxanthin. So you might want to pair one of these green veggies with fresh corn for your next dinner or BBQ. Keep in mind that while yellow corn is rich in these carotenoids, white corn is not. Try to skip over-dousing your cobs in butter. Corn is perfectly sweet and satisfying as is. If you want to get creative, you can add it to a variety of dishes to add texture and flavor. Corn comes cleverly encased in its very own steam-friendly shell. You can leave the husks on to grill or roast them for a heartier and earthy flavor, or you can strip them down and boil them. Adding too much butter and salt can get costly in the calorie department. Instead, lightly baste with some olive oil and then roll the cobs in your favorite spices. Some spices to try are chili powder, garlic, paprika, cayenne or even thyme. Salt is always a favorite, but use sparingly. Himalayan pink salts and unrefined sea salt may be better if you are thinking about seasoning your corn with salt products. Now, it is extremely important to distinguish corn from its byproducts. Corn is used in an alarming number of products on grocery store shelves. Most people don’t even realize that corn loses much of its nutritional value when it is processed. Some processed foods with corn based products may also cause allergies and negatively affect the health of consumers. This is why we always stress whole, plant-based foods. Here is a short list of some slight-of-hand aliases for corn byproducts that can be found at your local grocer. Corn flour, cornmeal. Corn gluten, Corn flakes, etc. The list of processed corn products reads like a sprawling scroll and may be hard to digest, literally. The best way to steer clear of processed corn products is to read your labels. Understand that if you can’t pronounce it, it probably isn’t healthy for you. And if you can, stick to the fresh produce section and the farmer’s market. A 2015 Harvard study suggests that corn is one of the ‘unhealthiest vegetables’ you can eat. As time goes on, nutritionists and dietitians have found that corn, like most grains, has very little nutritional value when not consumed in its whole and organic form. It is more of a filler than a nutritional corner stone after it is processed. Fresh Corn for the Win! Fresh corn on the cob reigns supreme. This whole food is the healthiest option and is arguably the tastiest choice when purchasing corn. If fresh corn isn’t within arm’s reach, go for frozen, non-GMO corn. Most frozen vegetables are flash frozen at the peak of freshness to avoid sacrificing nutrients. Read labels to ensure that your frozen corn has the non-GMO seal of approval. All in all, fresh corn is packed with nutrients that promote improved eyesight and atrial health. Try making this delicious, healthy Mexican corn salad. This recipe includes other whole, good-for-you foods including cilantro, cherry tomatoes, and radishes. Make it fresh and enjoy!